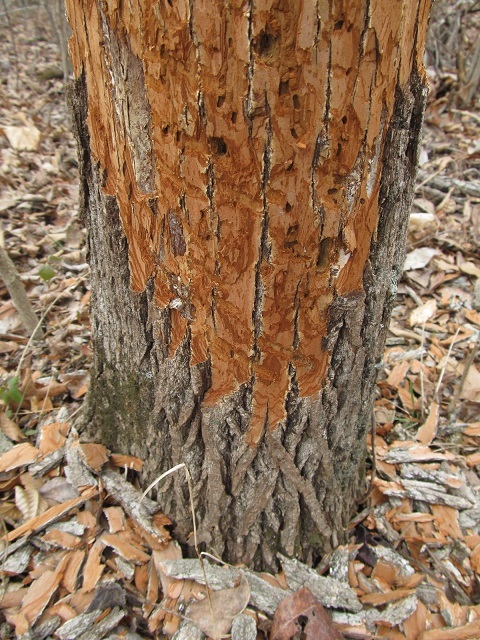 I’m looking forward to returning to Louisiana at the end of the month and have high hopes that our trail cams will reveal just what’s removing bark from the trees in our search area. 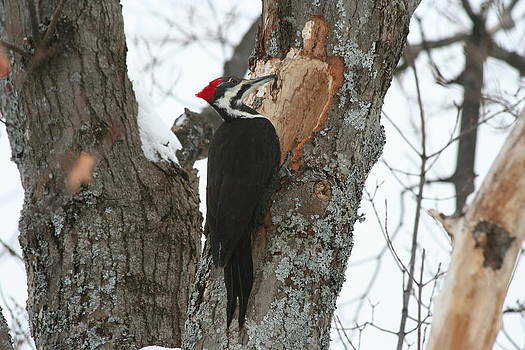 In the meantime, I thought I’d compile a new group of links to images showing bark scaling (without accompanying excavation) done or suspected to have been done by Pileated Woodpeckers. Obviously long dead snags are excluded. Compare these images with the work we suspect to have been done by ivorybills, all on live or freshly dead wood. As discussed in this and other posts, it’s our hypothesis that the differences are anatomically determined. Apparently a long dead snag, suspected PIWO, note small chips on the ground and the way they appear to have been flaked rather than pried off. A couple of additional examples.